Data can be precious when you're on the road. Maybe you're using your iPhone as a mobile hotspot to share its data plan with your Mac. Or maybe you got suckered into paying for a hotel or airplane Wi-Fi with a data cap. TripMode, new to Setapp, is perfect for this situation. 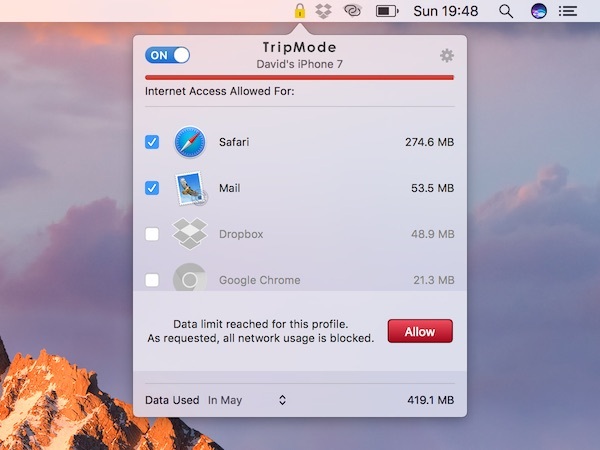 TripMode saves data by blocking which apps can connect to the Internet, and its flexible and powerful enough to be a must-have for any heavy traveler. Your Mac, after all, doesn't realize that you're suddenly on a data cap or sharing a terrible connection with a plane load of people. If it's connected, it wants to do everything, check every email account, sync every cloud folder, alert you to every update. 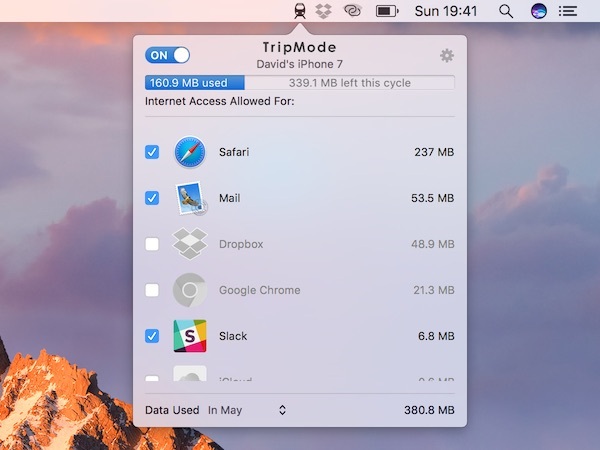 TripMode pulls the plug on this data free-for-all. TripMode lives in your Mac's menubar, where it appears as a friendly little train icon. Click it, and a drop-down menu shows all the apps running on your Mac, with a checkbox next to each one. Check an app and it's allowed to connect to the Internet. If it's unchecked, it can't connect. Since both uploads and downloads are blocked, this can prevent data-hungry processes like photo backups, Dropbox syncing, and automatic app updates. The main menu also has an On/Off slider where you can turn off monitoring on the current network. If you have unlimited data at home, for example, you probably want to keep TripMode off. After all, your home network is where you want things like cloud backups and app updates to happen. But if you do have a data cap on your home Internet plan, TripMode's real-time data counter could prove helpful enough to leave it on all the time. This also shows how much data has been used by app, and adds up the total data used, by the session, day, or month. That monthly view can reset on whatever day your billing cycle does. If you’re tetherig to a mobile plan, TripMode can even shut down access altogether before you hit your data cap. In TripMode's preferences, you can also set what should happen when an app tries to connect without authorization. TripMode's icon can flash in the menubar, and it can also play a sound or just say the application's name. This is handy to turn on, since TripMode works so seamlessly in the background that you might forget it's on, and then run into frustration when one of your apps doesn't work as expected. If it turns out you need an app to connect, you can check its box or just flip the slider to turn TripMode temporarily off. TripMode's real power lies in its Profiles feature. 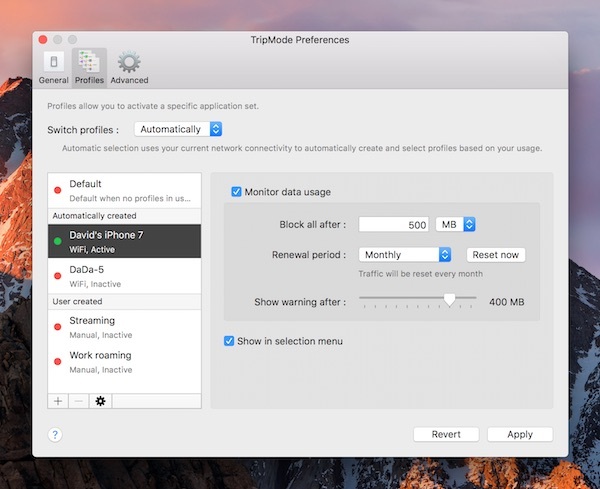 TripMode can automatically create new profiles for every Wi-Fi In the Profiles tab of the preferences, you'll see an option to switch profiles Automatically, Manually, or never. If you find yourself switching locations frequently, automatic or manual profiles can give you more granular control over where TripMode will lock down your data. Each profile can have its own settings. Why might you use TripMode Profiles? A profile for your home network can let everything through on your home network, but keep an eye on your monthly data usage. A profile for your iPhone's Personal Hotspot, so when you're tethered, Safari, Mail, and Messages can get online, but Dropbox, iCloud Drive, App Store, and psst even Setapp can stay offline. That way you won't use your iPhone's data with syncing or checking for app updates. If you decide to switch manually, a drop-down menu appears to let you select a new profile, while automatic profile switching happens only when you switch networks. Using too much data when you're traveling can really cost you. If TripMode can keep you from having to pay for extra data because your Mac greedily gobbled too much, well, you just got even more value from your Setapp subscription.